Langkawi is an archipelago that serves as an offshore administrative district of Kedah (Malaysia). Know more about the tourist attractions i.e. the places to see in Langkawi. Langkawi is the name of an offshore administrative district of Kedah state of Malaysia. Being an archipelago, in Andaman Sea, it comprises of as many as 104 islands within itself, with 5 being temporary islands revealed only at low tide. One of the most popular destinations of Malaysia, Langkawi is home to some of the most beautiful islands in the world, one of the reasons why it is visited by a large number of tourists every year. The exquisite natural beauty - in the form of caves, waterfalls and rich marine life, and rich history - comprising of many legends - of the place only add to its attraction. 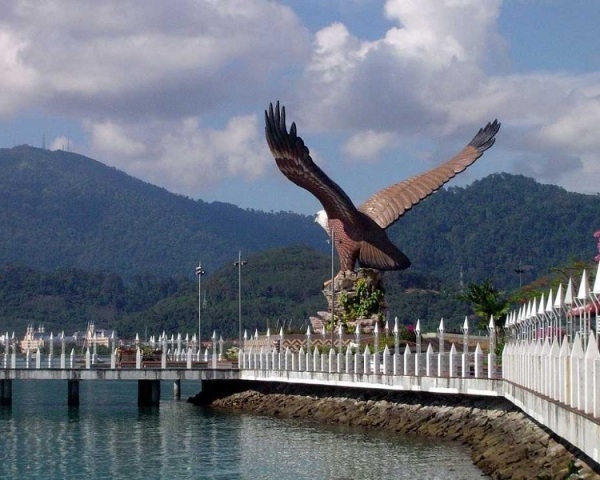 In the following lines, we will detail you about the varied tourist attractions of Langkawi. There are a number of villages in Langkawi that keep alive its age-old tradition and culture. Air Hangat Village, situated at a distance of around 14 km to the northwest of Kuah, comes across as a combination of spa and cultural park. Then, there is Atma Alam Art Village, the original art village of Malaysia, the place where hand-made batik originated in Langkawi. If you are a book lover, head to Malaysia Book Village in Lubok Semilang, Langkawi. The first and the only book village in Southeast Asia; it is a part of the International Book Villages and the Book Towns Movement. Langkawi abounds in natural beauty, its numerous waterfalls being a testimony to the fact. Telaga Tujuh is a magnificent water stream that is broken by a series of seven natural pools, the reason why it is also known as 'Seven Wells'. Temurun is another waterfall in Langkawi, which boasts of a height of 30 meters. Then, there is Durian Perangin Falls, a 14-tier waterfall that serves as the pride of Raya Mountain Nature Park. Last, but not the least, is Lubuk Sembilang, another waterfall in Raya Mountain Nature Park that is worth having a look at. Being an archipelago of as many as 104 islands, Langkawi is home to some of the most beautiful islands in the world. Pulau Dayang Bunting, the second largest island of the archipelago, is known for its limestone hills, dense forests, legendary lake and exotic animals. Pulau Singa Besar is another island that is worth a visit, mainly for its unique geology. Apart from that, the island is home to a distinctive formation, called the Singa (Lion) Formation. Pulau Tuba, one of the only two inhabited islands of Langkawi, is known for its scenic beauty. A trip to Langkawi without visiting its caves is as good as wasted. The geographical surprise lying embedded in the caves is something that needs to be discovered. Gua Cerita is the most popular cave of the archipelago, which abounds in the legendary tales of mystery and romance. The two limestone caves are sited one above the other and overlook the azure waters of the sea. Gua Buaya (Crocodile Cave) has the Kilim River actually flowing through it, while Gua Langsiar is for those who love to go mountain climbing. When the talk is of an archipelago with over 100 islands, can beaches be left far behind? Picturesque environs, azure blue waters, white sands and peaceful surrounds, all these characterize the beautiful beaches of Langkawi. If you are one of those who love to get lost in a crowd, then Cenang Beach, along with Tengah Beach and Datai Bay, is just the place for you. Amongst the most happening beaches of Langkawi, Cenang is the perfect place to enjoy the beauty of nature and chill out. However, if tranquility is what you desire, then Burau Bay, Kok Beach, Black Sand Beach and Tanjung Rhu Beach are the best bet. After relishing the beauty of nature, it is time for some manmade delights, isn't it! So, go ahead and visit Galeria Perdana, a gallery with as many as 2500 exhibits at display. For those who get thrilled with great heights, a ride in Panorama Langkawi Cable Car is one of the must-have experiences. Underwater World of Langkawi is another place you should visit, when in Malaysia. It serves as home to over 200 species of aquatic creatures. Last, but not the least, is a visit to Langkawi Crystaal, an exclusive showroom where you will find an amazing variety of handmade crystal ware, to keep as a memento or take back as a gift. Being a popular tourist destination of Malaysia, Langkawi is home to a wide variety of accommodation options, catering to almost every need and budget. If you are one of those for whom luxury is what matters, then the 5 star hotels in Langkawi, like Langkawi Lagoon Resort and Tanjung Rhu Resort, will serve your needs perfectly. Hardly a step lower in luxury come the four-star hotels, like Bayview Hotel and Bon Ton Restaurant & Resort. If the blend of economy and comfort is what you desire, three star hotels of Langkawi, like Best Star Resort, Geopark Hotel and Eagle Bay Hotel, will be just perfect for you. Langkawi International Airport, about 20 km from Kuah, is very well connected with places like Penang, Kuala Lumpur and Singapore. If you are planning to go by train, Alor Setar and Arau will be the main stations, from where you will have to take first, a tax/bus and then, a ferry. For road travelers, Kuala Kedah or Kuala Perlis will be the main points, from where ferry will be available for Langkawi. You will easily get a ferry from Kuala Perlis or Kuala Kedah for Langkawi. You can also opt for a ferry between Satun (Thailand) and Kuah or a cruise ship, from Port Klang and Singapore.